Turned professional in 1932, his career was extraordinary in the early 1940s because of a quirk of nature: he was not eligible for military service due to a rare blood condition. Bryon is the winner of five majors: the US Open (1939), Masters Tournament (1937 and 1942), and the PGA Championship (1940 and 1945). The number would likely be higher had not the Masters been postponed during World War II. He made the "cut" (i.e., generally placed in the top twenty finishers for a tournament) an impressive 113 times. He won 52 tournaments in his lifetime. 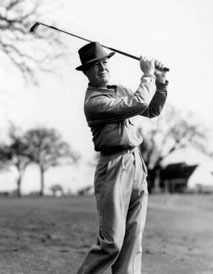 The EDS Byron Nelson Championship is named for him. Often given in references as Fort Worth, which is where he moved to as a child. He was born in a rural area near Waxahachie. Father: John Byron Nelson, Sr.